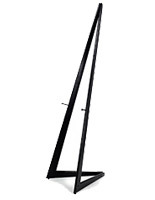 This Floor Easel Ships Fast When In Stock! Outfit a Studio, Gallery, or Business with the Proper Display Holder! Order a Floor Easel to Greet Patrons and Guests! This advertisement display, floor easel is the most functional way to showcase artwork. This wooden bi-fold display, also known as an art stand, features an adjustable design for you to present different size frames and menu boards. 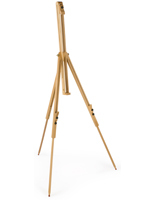 Each floor easel has two adjustable pegs with (9) peg holes for displaying frames at different heights. The pegs can be pulled out and placed at different heights to accommodate the size of the artwork or signage. 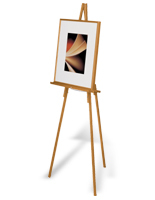 The floor easel also provides flexibility in displaying frames vertically or horizontally. Use this wooden display to hold a dinner specials menu in a restaurant or lounge. 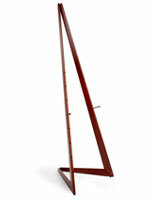 This floor easel is a perfect display stand for any business. This free-standing display is ideal for use in restaurants, galleries, museums, store fronts and studios. This floor easel, such as a picture holder or art display, has a simple and contemporary design to last a long time. We sell this wooden fixture in different finishes as well. The display stand, floor easel is shipped unassembled, and takes only a couple of minutes to set them up. We supply each unit with an instruction sheet for easy assembly. 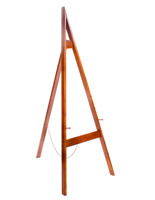 Change the way you present your artwork today with this unique floor easel.